Sue has an awesome job, running a national research centre to bring together the disciplines of robotics and computer vision. 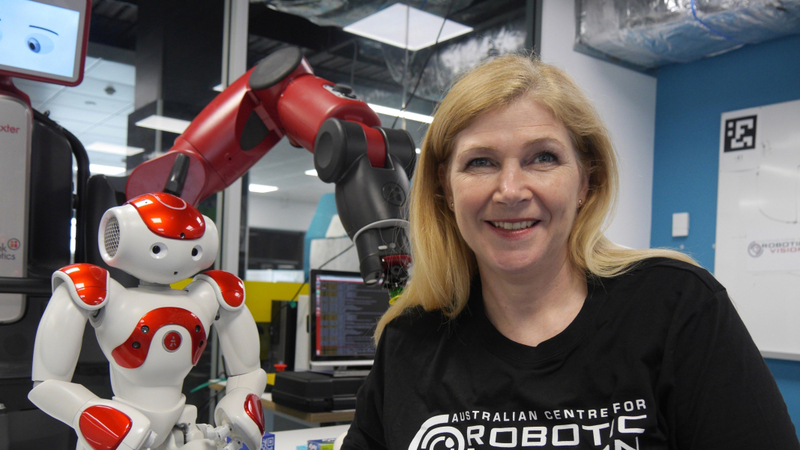 The Australian Centre for Robotic Vision is an ARC Centre of Excellence with more than 100 researchers distributed across Australian and overseas research institutions. By creating robots that see and understand their environment, we will finally reach the tipping point where robots can assume capabilities that have previously only been imagined. With a PhD in Earth Sciences, Sue escaped the lab to move into research management and commercialisation where she has demonstrated national leadership, directing and ensuring impact from multidisciplinary R&D programs spanning science, engineering, business, economics and law. Recently, Sue developed a successful $1.5m R&D project on humanoid robotics supported by the Queensland government to explore the vision capabilities of Softbank's social robot, Pepper. A Graduate of the Australian Institute of Company Directors, she serves on the Board of the CRC for Optimising Resource Extraction. She is completing her MBA with UQ Business School, gaining a deep insight into public cloud adoption and cybersecurity as part of an international consulting project with the Wharton Business School (UPenn). Sue has been described as, "not just useful, she is very, very useful." With the characteristics of her brand described as, "integrity, caring, genuineness, innovation and, perhaps most importantly of all, fun!"